Had some laptop problems as of late. My own doesn’t quite work anymore and I’m waiting on a good time to put down some $$$ to get a new one. Meanwhile, the one I’m borrowing is a frequent visitor to the blue screen of death so it’s pretty difficult to research and write anything since I’m constantly at risk of losing that work. Look at how big that table is. We’ve come so far. So the West has been pretty strong over the past five weeks, going 70-43. The current top eight teams in that conference fed off the worst ten teams in the East, going 23-8, but also winning a bunch of games against the top five by going 17-9. That’s a bit impressive when non-conference play this season (and probably every other) has typically consisted of the best of the West beating up on the worst of the East and vice versa while the top eight in the West versus the top five out East have played fairly even. Though I probably should include point differentials when the season is over, the playoff teams out West look to be crushing East teams not located in Atlanta, Chicago, Cleveland, Toronto, or Washington including a 63-7 record at home when they have at least one day of rest. 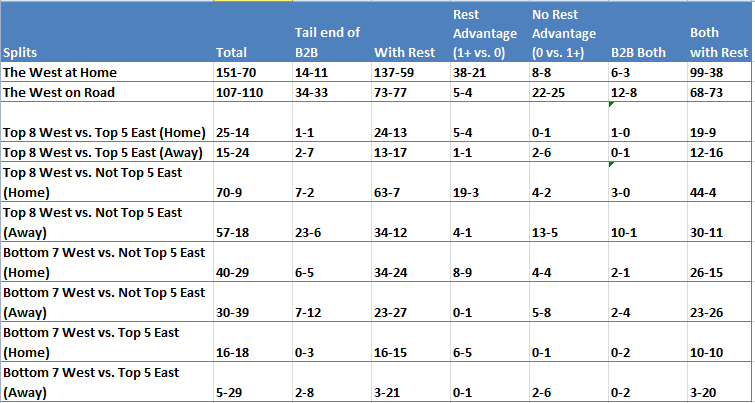 Only one bottom-ten team out East has more than ten wins against the West, which is Boston at 12-18. That’s huge, really, as they’ve found themselves in the middle of the race for a sixth to eighth seed in the playoffs. Milwaukee, Miami, and Brooklyn, the sixth to eighth seeds right now, have 11, 12, and 13 wins against the West, respectively. The best of the East have also beat up on the lottery squads out West, though Phoenix has played the East strong at 18-11. A little bit of cherry picking on their part, but that’s normal and not even that bad compared to past West teams who dominated the East but struggled versus the West. Among other instances, the 2001 Rockets went 25-5 against the East but missed out on the playoffs at 45-37. Point Differential: This is where 2014 separated itself from the rest of the 2000s and 2010s. 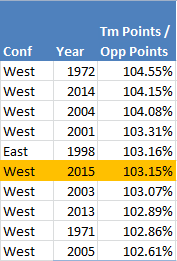 West PPG/East PPG: This kind of adjusts for high and low scoring games. A 70-60 victory may or may not be more dominant than 130-120. We can criss-cross eras a bit easier with this. 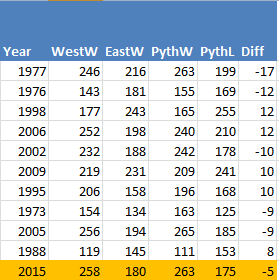 Pythagorean Win Difference: The West’s real record is multiple games worse than their Pythagorean one. How weird is this? Pythagorean Win% Difference: I don’t know. I was bored. 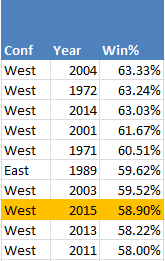 The 2015 West’s win percentage isn’t too special, however. Which means, when taking margin of victory into account, their Pyth record is going to be a bit better. But, while point differential can be fun to look at it can sometimes be misleading because of what happens during garbage time. Pft, like that’s ever stopped me from getting carried away. I mean…non-conference Pythagorean record…?! Anyway, nice to see the laptop went a couple hours without bogging down. With some more luck there might be more #stuff posted.